Who Owns Dollar Rent a Car? Dollar Rent A Car is owned by the Hertz Corporation, a subsidiary of Hertz Global Holdings, and operates out of its headquarters in Estero, Florida. Dollar shares company-owned locations and franchisee locations with its sister brand Thrifty Car Rental, also owned by Hertz. The Dollar Rent A Car philosophy is built around providing exceptional customer service for each and every car renter. They ensure that each employee works toward this goal with their unique Customer Driven training program. Dollar is known for offering a great value on car rentals around the world. In 1965, Dollar Rent A Car was founded in Los Angeles as "Dollar A Day Rent A Car." The company's first fleet was made up of a few Volkswagen Beetles with manual transmissions and no air conditioning. The company operated independently in LA until it was acquired by Chrysler in 1990. Seven years later, Dollar joined Thrifty Car Rental in going public as Dollar Thrifty Automotive Group. Dollar Thrifty Automotive Group was acquired by Hertz in 2012, and all three brands' headquarters relocated to Florida in 2015. 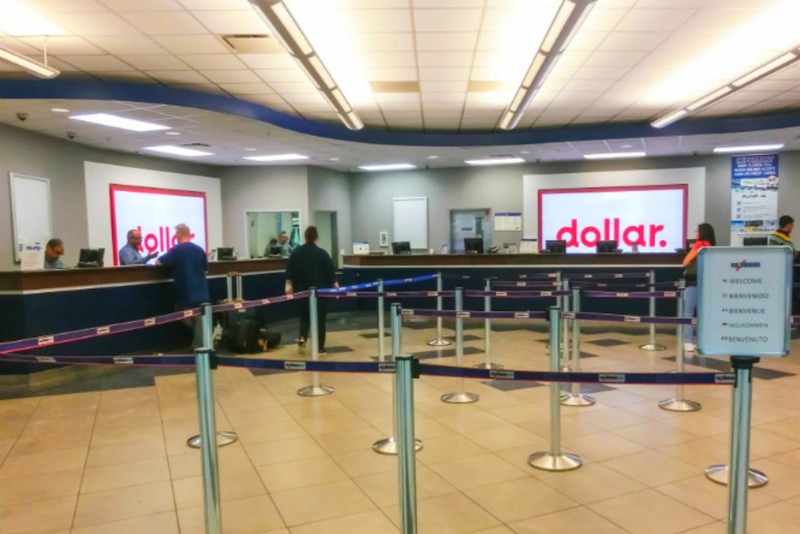 Dollar has been partnering with international car rental brands to expand their reach since 1997, when it joined Paris-based Europcar International to link their reservation systems. Europcar and Dollar customers in the United States, Canada, and Latin America are able to reserve cars from either brand, at over 2,800 locations in 134 countries. Dollar opened its own corporate-owned rental locations across Europe in 2013, partnering with Ryan Investments in Ireland to bring even more locations to customers. The latest additions to Dollar Rent A Car's international locations include Poland and Sri Lanka. Enjoy extra perks. Dollar's free rewards program gets you quicker reservations, priority counter service, the ability to skip the rental counter, and the potential to earn free rental days as you accumulate rewards. Consider Dollar for your business travel. Business travelers can join Dollar 4Business for a rewards program tailored to corporate travel. Perks include extra discounts and waived fees for additional drivers, young drivers, and changes to a reservations—all common issues for a business traveler. It also offers long-term business car rentals. Be aware of other partners. Dollar works with companies like Southwest, American, United and Hawaiian to offer packages that bundle flights and cars, and this can sometimes save you money. You can also use Dollar rentals to earn miles at several major airlines or hotel points at IHG Rewards Club. Members of BJ's Rewards Club, Veterans Advantage, and Travelers Advantage can also find savings with Dollar.